The Common Goldeneye is a cold-hardy, circumpolar, cavity nesting, diving duck that breeds in the northern boreal forests of North America and Siberia. It is one of the last ducks to migrate south in the fall and will winter as far north as they can find ice-free water. The Common Goldeneye is an uncommon wintering bird in Tennessee and may be found in the state from early November to early April. The North American breeding range extends across the forested regions of Canada, and most birds winter along the Pacific and Atlantic coasts, but also inland from southern Canada to Mexico. Description: The male’s head is greenish-black with a bright white oval patch near the base of the bill. The back, wings, and tail are black, and the sides, breast, and belly are white, and the eye is a golden-yellow. The female’s head is chocolate brown, her body is gray, and she has a pale yellow eye. In flight both the male and female have a white patch in the wing; the male’s patch is larger and solid white. When the birds take flight the wings make a distinctive whistling sound. Male Bufflehead is smaller, with a larger white patch on the back of the head, not at the base of the bill. 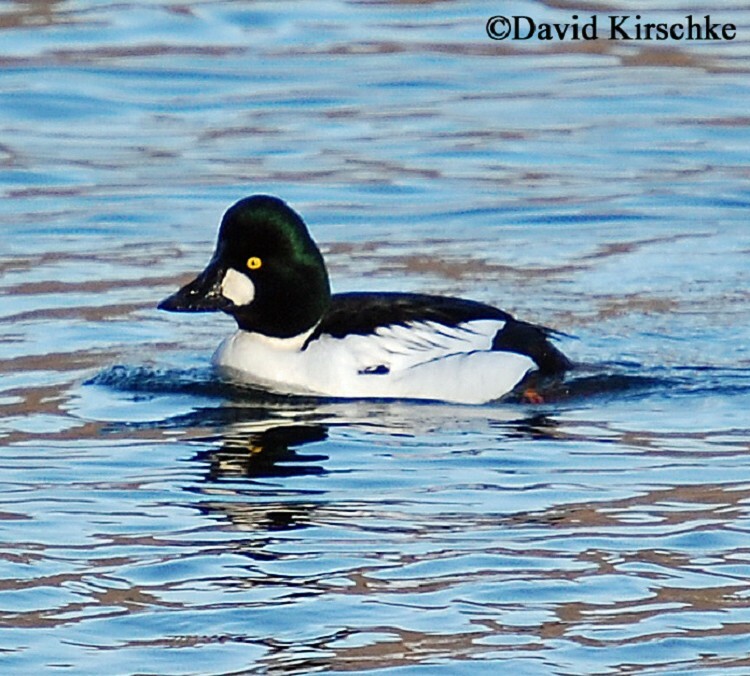 Barrow's Goldeneye is nearly identical to the Common Goldeneye and is extremely rare in Tennessee with only one confirmed record in the state. Habitat: In Tennessee they are found on ponds, deeper lakes and rivers. Diet: Aquatic invertebrates, and occasionally small fish and vegetation. Status in Tennessee: The Common Goldeneye is an uncommon wintering bird throughout the state and a fairly common migrant. They arrive in early November and depart by early April. 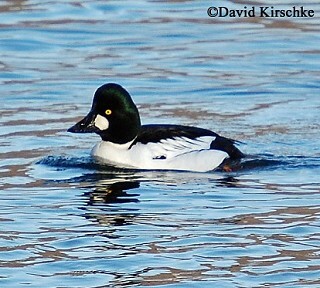 Over 1200 Common Goldeneye were seen in December 2009 at Pace Point in the Tennessee NWR - Big Sandy Unit. After leaving the nest ducklings are unable to recognize their mother and will sometimes join the brood of another female. This can happen when two adult females get into a territorial dispute and their young scatter and get mixed up with one another. The Common Goldeneye is a cavity nester using natural cavites in live or dead trees or holes excavated by Pileated Woodpeckers. The highest reported nest cavity was 43 feet above the ground. Many species of duck are known to lay their eggs in the nests of other ducks. The eggs of several species have been found in Common Goldeneye cavities, both natural cavities and nest boxes, including Hooded Mergansers, Barrow’s Goldeneye, Common Merganser, Bufflehead, and Wood Duck. The oldest known Common Goldeneye in the wild was 18 years, 5 months old. Best places to see in Tennessee: State and federal waterfowl refuges across the state. Pace Point in the Tennessee NWR - Big Sandy Unit, and Paris Landing State Park are good places. They may occur on other reservoirs across the state. Eadie, J. M., M. L. Mallory, and H. G. Lumsden. 1995. Common Goldeneye (Bucephala clangula). The Birds of North America, No. 170 (A. Poole and F. Gill, eds.). The Academy of Natural Sciences, Philadelphia, PA, and The American Ornithologists' Union, Washington, D.C.